Spring Flower Watercolor Wedding Unity Candle & Matching Tapers - Our dripless Spring Flower Watercolor Wedding Unity Candle Set is made in the USA, and decorated with hand painted garden flowers and genuine Swarovski Crystals. Each set is personalized and is printed with your choice of 6 verses, OR if you do not want one of the 6 verses, you can select choice number 7 and your unity candle will be personalized with only the names and wedding date (please see descriptions below). First Initial of the Groom's Last Name, First Names of the Groom and Bride, the Groom's Last Name and the Wedding Date. Decide if you want the Groom's name listed first or the Bride's name listed first. Matching tapers include the Bride and Groom's First Name Initials. One 12" taper includes the First Initial of the Bride's First Name and the other 12" taper includes the First Intial of the Groom's First Name. "These three remain: faith, hope and love. But the greatest of these is love." "This day I will marry my friend; the one I laugh with, live for, dream with, love." "To have and to hold from this day forward." "A man shall leave his father and mother and shall cleave to his wife, and the two shall become one flesh." First Initial of Groom's Last Name, First Names of the Groom and Bride, the Groom's Last Name and the Wedding Date. Decide if you want the Groom's name listed first or the Bride's name listed first. NO verse will be included with choice #7. Select Color of Candles: Creamy White (shown in picture above) or Light Ivory. Includes: 3 x 9 inch Unity Candle and two 12" Tapers. Comes wrapped in cello and tied with an organdy ribbon. 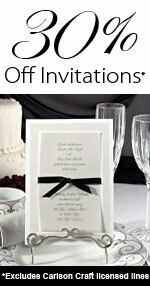 12 Wedding Invitation Unity Candle Designs - Use Your Own Wedding Invitation!